Fortunately, innovative advances in fire-rated glass technology over the last 30 years has paved the way for clear, wire-free fire products in dramatically large sizes that outperform traditional wired glass, both in impact safety and life and property protection. This latest generation of fire-rated glazing products can now be extensively used in stairwells, corridors, wall partitions, lobbies, interior courtyards, and other places where masonry, gypsum, or other conventional, opaque fire-resistant wall materials were once the sole choices. 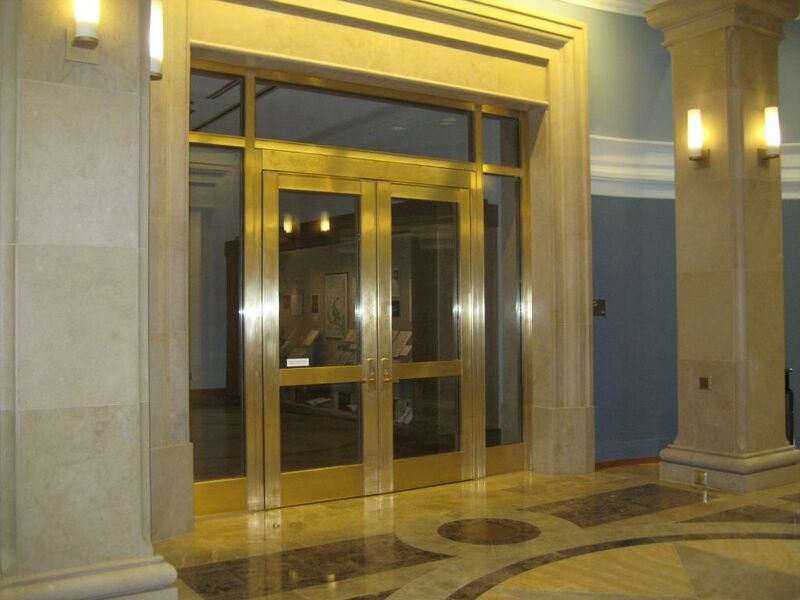 For years, polished wired glass was the only transparent fire protection product available, and was prescriptively written into the building codes where glazed openings were desired in fire-rated doors and window openings. Wired glass continues to be specifically referenced in fire-rated door and window closures under the 2010 National Building Code of Canada (NBC). However, NBC also references the National Fire Protection Association (NFPA) 80-2007, Standard for Fire Doors and Other Opening Protectives. Until the very early 1990s, NFPA 80 addressed only wired glass. As fire-rated glazing product technology developed, the standard was revised to recognize new alternative products to wired glass. Prescriptive references to wired glass gave way to generic performance requirements to specified door and window test standards. NFPA 80 also recognizes the application of fire-resistive products that pass the higher fire wall test standard of Underwriters Laboratories of Canada (CAN/ULC) S101, Fire Endurance Tests of Building Construction and Materials. Fire-resistive glass can also be used extensively in the building’s exterior, which is the case for this two-hour curtain wall. Efforts are underway to directly correlate sections of the 2015 edition of the NBC with the current provisions of NFPA 80. These changes would replace outdated references to “wired glass” or “glass block” with language recognizing tested and listed fire-rated glazing products, in general, to allow for application of the broad range of products available. The proposed changes include language recognizing the application of fire-resistive versus fire-protective glazing, and will update the wording relating to locations requiring safety glazing. The proposals are currently part of the work plans of the Canadian Commission on Building and Fire Codes’ (CCBFC’s) Standing Committees on Fire Protection and Housing and Small Buildings. Should they become a part of the 2015 edition of the NBC, designers, builders, and code officials will be able to more effectively provide for the use of a wide range of tested and listed products in the construction, inspection, and occupancy of buildings. Fire-protective glass meets CAN4-S104/UL 10b, Fire Tests of Door Assemblies, and 10c/CAN4-S104/UL 9, Fire Tests of Window Assemblies. Designed to compartmentalize smoke and flames, the material is subject to application, area, and size limitations under the building codes. Examples include traditional wired glass, safety wired glass, and fire-rated transparent ceramics. 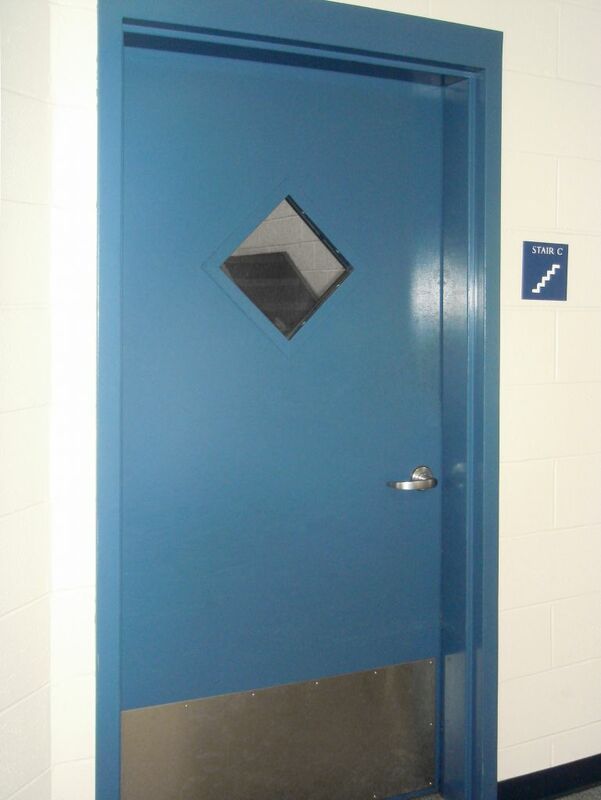 While wired glass and ceramics are rated up to 90 and 180 minutes respectively, they are typically limited to small door vision panels; size limitations may apply in ratings and applications over 45 minutes, and where temperature rise doors are required. Additionally, fire-protective glass, such as ceramics and wired glazing, have limited use in one-hour walls, and are prohibited altogether as sidelites, transoms, and windows in one to two-hour exit enclosures and two-hour interior walls because they do not block radiant heat. Fire-protective, safety-rated ceramic glass is limited to 64,516 mm2 (100 sq. in.) in this temperature-rise 90-minute door due to radiant heat concerns. To exceed this size limit, fire-resistive glass must be used. Fire-protective safety-rated ceramic glass is limited to 64,516 mm2 (100 sq. in.) in this temperature rise 90-minute door due to radiant heat concerns. To exceed this area, fire-resistive glass must be used. Fire-resistive glass meets CAN/ULC-S101—the fire test standard for wall assemblies. This type of glazing compartmentalizes smoke and flames, and blocks the transmission of dangerous levels of radiant heat. When installed in appropriately tested framing, it performs like a gypsum or masonry wall. For that reason, it is not subject to the same area or vision panel size limits that apply to wired glass and other fire-protective glazing. Examples include fire-resistive tempered glass units and multi-laminates. Glass meeting the CAN/ULC-S101 standard for wall assemblies has made it possible for architects to use fire-rated glazing as never before. Designers now have the freedom to design floor-to-ceiling and wall-to-wall expanses of glass up to two hours without having to sacrifice transparency, clear views, and design intent to meet building code requirements. Subsequently, fire-resistive glazing can be used in one- and two-hour stairwells, walls, and even exterior curtain wall applications where property lines are concerned. 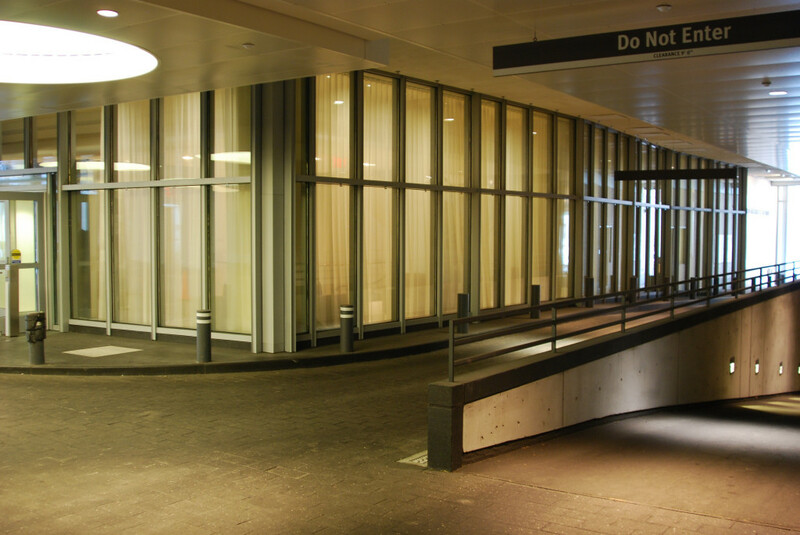 Incorporating fire-rated glass in a building’s design also provides many benefits that enhance safety and security, as well as contributing to sustainable design principles. Fire-rated glass provides continuous passive fire protection 24 hours a day, seven days a week, without mechanical triggers that require maintenance and risk failure in an emergency. South of the border, System Planning Corporation evaluated data from the U.S. Federal Emergency Management Agency (FEMA) National Fire Incident Reporting System (NFIRS) to determine the relative role of built-in or passive protection, which refers to the use of fire-resistant construction—such as doors, openings, and walls—to prevent or slow fire’s spread from the room of origin to other building spaces, limiting building damage and providing more time to occupants for emergency evacuation or to reach an area of refuge. 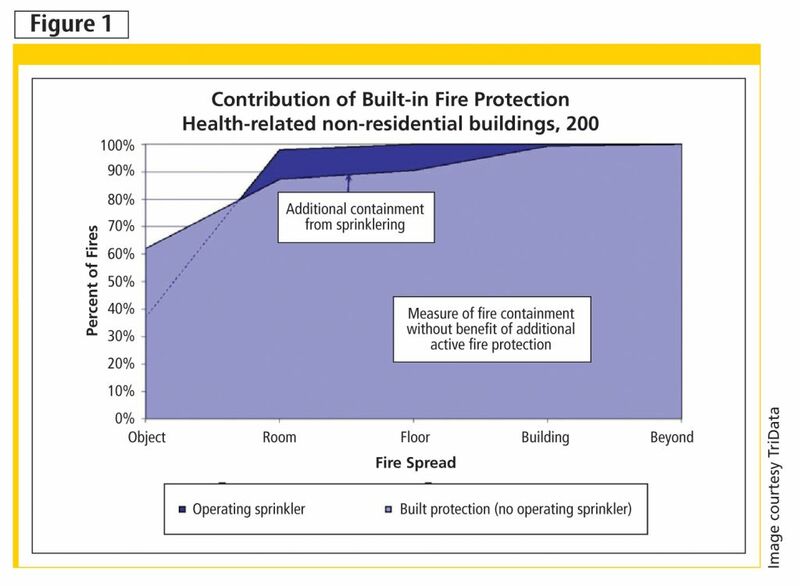 In healthcare facilities, the report found built-in or passive fire protection performed 90 per cent of the work in limiting the fire spread to the room of origin.1 As shown in Figure 1, active fire protection systems such as sprinklers and quick fire department response provided the other 10 per cent, showing how critical and effective built-in or passive fire protection is when it comes to total building fire protection. Fire-resistive glass and framing delivers both maximum fire protection and transparency to this two-hour exit enclosure. NFPA published a report on “U.S. Experience with Sprinklers and Other Automatic Fire Extinguishing Equipment.”3 NFPA research found when sprinklers are present in the fire area, they operated in 93 per cent of all reported structure fires. (While this is based on U.S. data, the findings are still relevant since all sprinklers require a mechanical trigger.) Given this margin of sprinkler failure, every fire protection strategy should incorporate an alternate means of built-in or passive fire protection in order to avoid dire consequences to all occupants. Fire-rated glass also contributes to added security by having improved lines of sight through transparent walls, doors, and openings. Before fire-rated glass, stairwells could only use masonry or other opaque fire-resistant wall materials that create a closed-off system with zero visibility, leaving occupants prone to attack in these areas. Additionally, incorporating clear lines of sight significantly benefits first responders by giving them an opportunity to visually assess the situation before charging in, greatly improving fire and life safety. 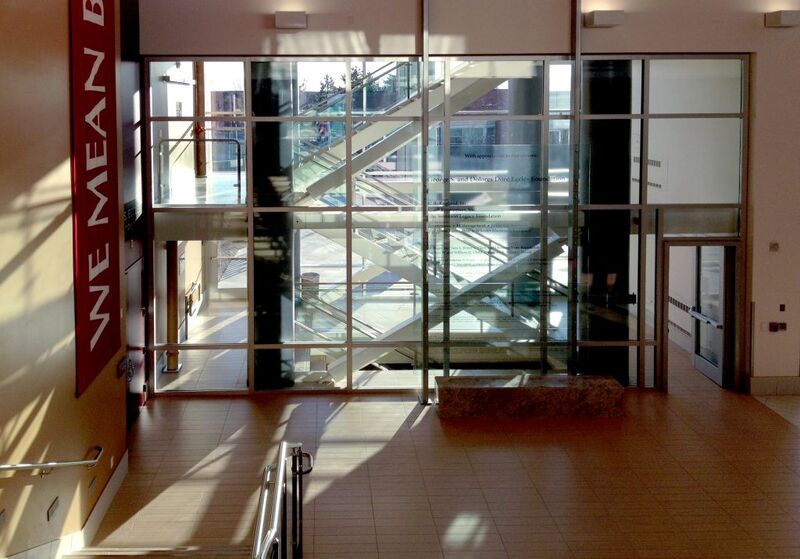 By using fire-rated glass in stairwells, corridors, wall partitions, lobbies, and interior courtyards, natural light can penetrate further into the building, and artificial lighting is maximized between spaces. This helps cut down electrical use and minimize the building’s carbon footprint. When used in exterior applications, fire-rated glass can be insulated with low-emissivity (low-e) or high-performance glazing, further improving energy efficiency. This graph shows the contribution of built-in fire protection for health-related non-residential buildings in 2003. High-performance low-e is combined with 45-minute fire-resistive glazing to deliver enhanced energy performance, as well as clear views to the outdoors while meeting property-line requirements. Indeed, more glass lets in more light, and being able to use fire-rated glass to help illuminate areas with natural daylight has a positive effect on occupant health, well-being, and productivity. Architects in the healthcare arena are using evidence-based design (EBD), or the practice of basing decisions about physical space on research and data, in an effort to improve patient and staff well-being, patient healing, stress reduction, and safety. High-performance low-emissivity (low-e) is combined with 45-minute fire-resistive glazing to deliver enhanced energy performance as well clear views to the outdoors while meeting property line requirements. In terms of resilient and sustainable design, the intended use of fire-rated glass for built-in or passive fire protection helps prevent or slow the spread of fire from the room of origin to other building spaces. This effectively limits building damage and provides more time to the building occupants for emergency evacuation or to reach an area of refuge. One fundamental benefit of built-in or passive protection has been the preservation of buildings through and following fire events—even major ones. The technique helps minimize loss of components and materials, with the environmental benefit of reduced resource needs including raw materials, manufacturing energy and resources for construction, reconstruction, and renovations required due to fire damage. Fire-rated glazing as a specialty product has carved its own niche in the construction industry over the last 30 years. Recent technological advances have even made it possible for fire-rated assemblies to also protect against hurricanes, blasts, and ballistic attack. As designers continue to demand more from the building products available to them, and as Canadian codes continue to evolve, manufacturers of fire-rated glazing will strive to provide higher-performing products that improve life safety, property protection, and esthetic design. 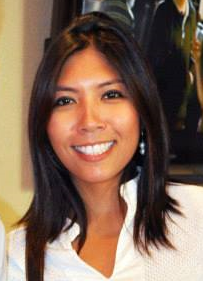 Diana San Diego has over seven years of experience in the architectural glazing industry. As the director of marketing at SAFTI First, a manufacturer of fire-rated glass and framing systems, she oversees the advertising, content management, media relations, promotional activities, and communication initiatives for the company. 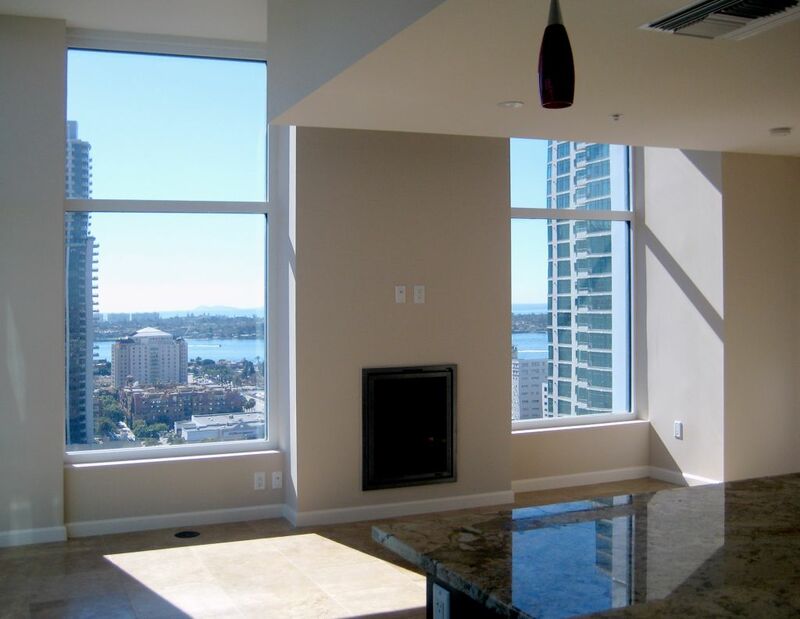 San Diego is also involved in creating and promoting educational programs, including American Institute of Architects (AIA)-registered webinars about fire-rated glazing. She can be reached at dianas@safti.com.